Your perfect outdoor oasis begins with detailed planning and design. Our professional landscape design team at Pioneer Landscaping understands that each person is unique, and so should each yard be. We supply beautiful ideas for every budget, and use a specialized program to provide you with a detailed 3D design of what your property could look like. Once we discover something perfect for you, we bring your ideas from a design to reality! For expansive and highly functional decks that are perfect for outdoor gatherings, look no further than Pioneer Landscaping. We can help you plan out the deck of your dreams, and we will take care of the rest. Fences are available for added privacy, protection, and property marking. We install, repair, and maintain fences of all types: post and rail, privacy, chain link, barbed wire, and so much more. Our fencing services will keep your yard in top functioning condition. Patios create usable, flat surfaces for further entertaining outdoors. Our patios are custom made to your specifications and requirements. Finish the look with beautiful patio furniture to enhance your backyard! 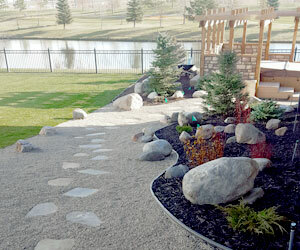 The construction team at Pioneer Landscaping can help you achieve the look you are going for when it comes to walkways. We offer pavers, concrete, and gravel walkways that are as functional as they are eye catching. Our leveling, grading, and trenching services are available to keep your soil and the rest of your yard as healthy as possible. We can level out the soil to keep everything even and make further construction or use much more pleasant in the long run. Grading and trenching is available to loosen up the soil and make it more workable for a number of different projects. Tree, Shrub, and Flower Care: From removing shrubs to planting trees, we offer all services to look after the plants that brighten your yard. Whether you have a garden or shrub bed, we have experience with both and will get your green spaces looking trim once again. We have experience with both fireplaces and fire pits to enhance your backyard spaces. These additions offer warmth and aesthetics to your outdoor spaces. Entertain your friends and relax with your family around our carefully crafted fireplaces or fire pits! Pioneer Landscaping constructs ponds and fountains for added ambiance. Create an outdoor oasis with a soothing water feature that creates an environment unlike any other. Sprinklers are a convenient way to help maintain lawn and plant health. They ensure everything is well watered as long as they operate properly. We provide all irrigation services, from blow-outs to installations. Take advantage of unused space and increase attractiveness by having us remove large areas of overgrowth and scattered leaves. Our team along with our equipment has the power needed to remove tons of junk or supply tons of soil, rock, mulch, and other materials. We not only deliver landscape materials, but also install them for you! Adding natural beauty to your yard is easy with our professional help. We are experienced in matching plant types to personalities. Whether you are seeking low maintenance trees or vibrant flowers, we can help you pick what’s best for your lifestyle and incorporate it into your yard.